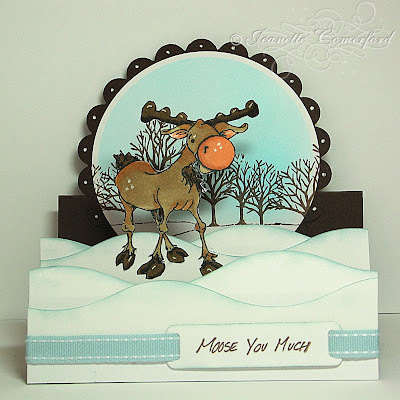 Wanted to show you the step card that I made using this cute Whimsy Moose. I found the directions on how to make a step card on Splitcoasters. Just search for: TLC190 Stair Step Fold. It was really easy and there are endless possiblities. I have made another step-card but I used my new SweetNSassy stamps so you'll have to wait until the Blog Hop to see it! You can check my side-bar for all the dates. To make the snow, I used my Creative Memories wavy cutter and then sponged the edges with some Soft Sky ink. The sky background was stamped and then I air-brushed it with my copic airbrusher. The moose colored with copic markers and then I carefully cut him out. Do you like the sentiment? Well, you can get this and others at Whimsy as well! Denise had added some sentiments to go along with all these adorable little animals! Here is a side view of the card. Denise is looking for a Guest Designer for the month of January. If you'd like to try out, then visit Whimsy Stamps for more details. You have until December 27th to enter. My fellow DT member Hanne has some cute Whimsy Candy on her blog this week and I'll be having some Whimsy candy of my own next week! In case I don't get another opportunity to post again before Christmas, I'd like to wish all of you the very Merriest of Christmases and I really hope that there is some yummy craft goodies under the tree for you all! I appreciate all of you who visit and especially those of you who leave such lovely comments! I love visiting your own blogs and being inspired by your creations! What a gorgeous card. I totally LOVE the layout! This is fabulous Jeanette, what a fun card! I love the image and the design is just brilliant. Jeanette!!! This is simply fantastic hunny - I love all the snow layers and the cute image. Wonderful stair-step fold with the snow scene, great creativity! This is so lovely, Jeanette! I really love the snowy hills that you cut with the curvy cutter that is brilliant! The moose is adorable and so it that sentiment! Merry Christmas to you and your and all the best for 2009!!! FABULOUS Jeanette! Love your take on this card! TFS! Wow Jeanette! This is so Cute and Fabulous!! I love the image and the design is just brilliant. Thank you for your lovely commentary on my blog. May your Christmas wishes come true. Wishing you and your family a wonderful Christmas and Happy New Year. Jeanette this is such an adorable card! LOVE the step card...it's awesome! Love love love it! Wow!! Love the whole look of this card!! The colors are fabulous, as well as your coloring, and the layers of snow look wonderful!! Great idea!! I want to wish you a very merry Christmas and the happiest New Year!!! Wow this is so cute!! I absolutely love it!! Airbrushing, WOW!!! Oh Jeanette I love your 3 step card. That moose is so funny. What a wonderful card...I love the image and your colouring is awesome! Wishing you a very merry Christmas and all good wishes to you and your family for 2009.
this is awesome. i love how you created the snow szene! Great creation Jeanette! 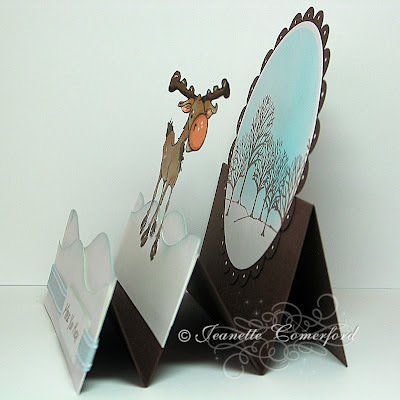 this step card is super,image is cute,snow scene brilliantly created and love the sentiment!